Ever since he was an innocent, wide-eyed eight-year-old traveling to Gola Island on a wooden curragh, Sabba Curran dreamed of captaining his own boat. Now he is doing just that – and bringing much joy to his many local and foreign passengers. From April to September, the Donegal-born father takes hundreds of visitors, from Ireland and from many other countries, across the short stretch of the Atlantic to Gola, one of the most scenic and historic islands off Ireland’s far northerly coast. Passengers on board ‘The Cricket,’ an Aqua-Star 38, delight in a birds-eye view of the basket of islands that lie just 10-minutes offshore before they reach the charming, beach-side, stony pier. Here they enjoy leisurely walks along the gravel pathways past charming renovated homes to the makeshift café and shop of Eddie McGee, the uncrowned King of Gola, and on to spectacular caves, sea-arches and the old schoolhouse. Along the way, they pass a monument to two local island men involved in smuggling weapons for the Irish Revolution of 1916 and another honoring the lives of relatives of the islanders who died in the Twin Towers disaster in New York, better known as the 9/11 attacks. Gola is also known as the island that may have provided inspiration to famed author Robert Louis Stevenson in his writing of his well-known novel, ‘Treasure Island,’ an adventurous tale of buccaneers and buried gold. 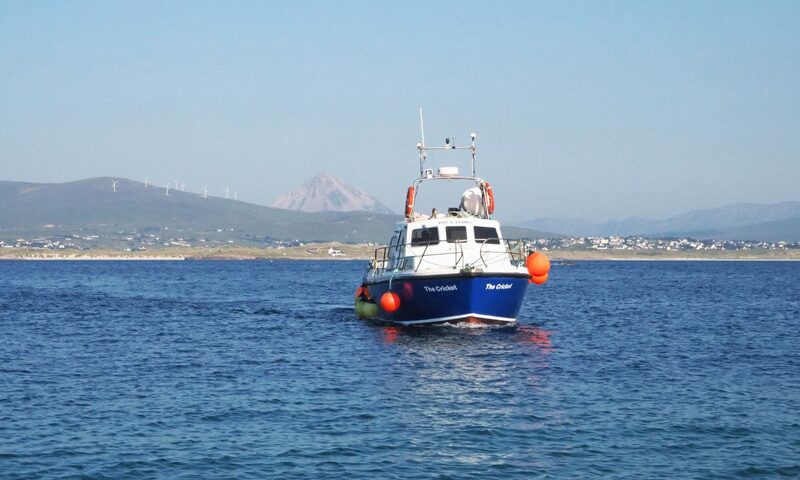 In addition to trips to the island, Sabba also hosts groups of five people or more on scenic, one-hour tours of some of the other islands off the northwest Donegal coast including Inishirrer, or to Inishmeain. For those wishing longer stays in this picturesque corner of Ireland, Sabba also rents a fully-furnished, four-bedroom house on Tory Island that can sleep up to 12 people, with wonderful sea views. For lovers of fishing, Sabba can also take up to ten people on ‘The Cricket’ for full-day fishing expeditions at a cost of 450 euro boat-hire per day and 15 euro per rod hire. © 2018 Gola Ferry Service ALL RIGHTS RESERVED. No part of this website, text or photographs, may be reproduced, stored in a retrieval system, or transmitted, in any form or by any means without the prior permission in writing of Gola Ferry Service.